Terrie Leigh Relf: What types – and forms – of writing do you do? Loren Rhoads: My most recent book is a nonfiction travel guide called 199 Cemeteries to See Before You Die. I’ve written about cemeteries online for Mental Floss, Legacy.com, Gothic Beauty, Scoutie Girl, and other places, both as straight travel articles and as personal essays. I blog about cemeteries at CemeteryTravel.com. I’m also a novelist. I’ve written a space opera trilogy, published by Night Shade Books, and co-written a dark urban fantasy novel about a succubus and her angel, published by Automatism Press as Lost Angels. I write short stories, too. 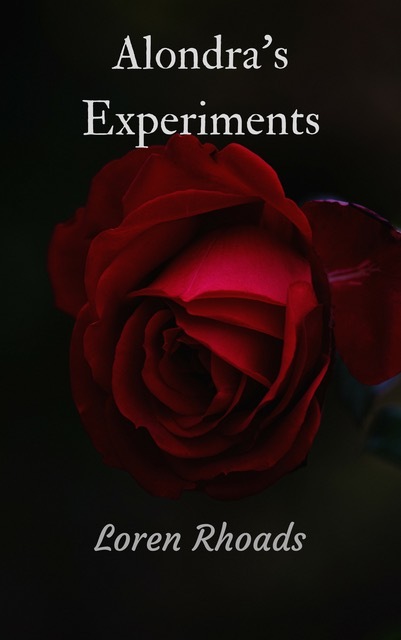 A chapbook of them called Alondra’s Experiments just came out for the kindle. Those stories combine horror and paranormal romance with a vampire and real-world magic. Terrie Leigh Relf: What is your area(s) of subject matter expertise? How did you discover this niche? What intrigues you about it? Loren Rhoads: I started visiting cemeteries by accident. My husband was headed to Barcelona to do sound for the machine performance group, Survival Research Laboratories in 1991, when the first Gulf War derailed our trip. We ended up in London, where we hadn’t planned to go. I discovered a book of black and white photos of Highgate Cemetery, which inspired us to visit, even though it was January. The crumbling Victorian cemetery was glorious, full of angels and friendly feral cats. After that, we went on to Paris, where we saw Pere Lachaise Cemetery and visited Jim Morrison’s grave. From that point on, I was hooked on cemeteries and decided to become a travel writer. Several years later, I met Thomas Roche, then the nonfiction editor of Gothic.Net, at a reading at Borderlands Books. Tom mentioned that they were always looking for nonfiction for the site – and they paid really well – so I pitched them a column about cemeteries as travel destinations. Many of those columns ended up in Wish You Were Here: Adventures in Cemetery Travel. Its second edition came out last year. Terrie Leigh Relf: How do you balance your creative and work time? Loren Rhoads: I’m not very good at it. Left alone in my room, I spend more time feeling bad about not writing than actually writing. Still, when I’m working on a book, whether on a deadline or because I’m doing Nanowrimo, I can grind out the words. I end up writing in the morning before everyone gets up, once the kid has gone to school, after lunch, after school, before bedtime . . . every chance I get. I write so much that I need to take time off afterward to recharge. My creative life is more like a swing than a balance. Loren Rhoads: Even when you enjoy your own company, it can feel isolating to write. I’ve joined a group in San Francisco called Shut Up and Write, which meets in a café on Wednesday mornings. We spend a few minutes going around the table, introducing ourselves and the project we’re going to work on for the day, then sit in companionable silence for an hour and a half, take a short break, then begin again for another hour and a half. The time we write in silence is so productive for me. Shut Up and Write has chapters all over the US and a few around the world. You can see if there’s one in your area here. It’s free to participate, beyond supporting the café with the price of a cup of coffee. 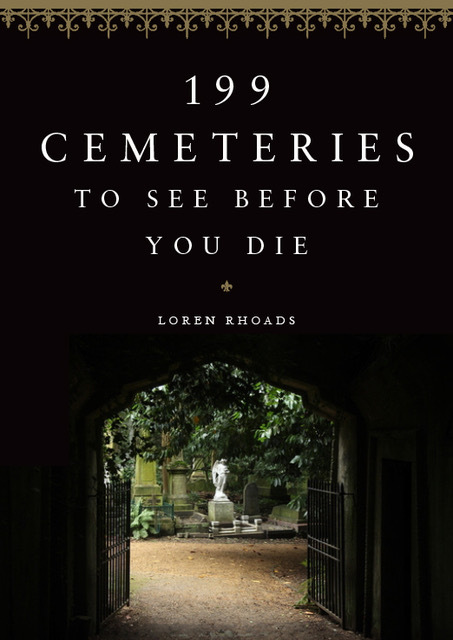 Loren Rhoads: 199 Cemeteries to See Before You Die, my 11th book, was published in October 2017 by Black Dog & Leventhal, which is an imprint of Hachette. Over the years, I’ve self-published and been published by indie presses, small presses, and Scribner. The advantage in having a big publisher is the reach of their publicity department. The publicist at Hachette got my book in front of writers for Time magazine, the New York Times, the Wall Street Journal, and on Under The Radar on NPR. 199 Cemeteries also made the preliminary ballot for the Bram Stoker Award for Nonfiction. Loren Rhoads: My next book will be about the pioneer cemeteries of the San Francisco Bay Area. Even though the Western history of Northern California began with the foundation of Mission Dolores in what became San Francisco in 1776, everything changed again after the discovery of gold in 1848. Each of the towns in the Bay Area was once dedicated to a different industry, whether logging or leather-tanning or orchards or dairy ranching, and the different waves of immigration are recorded in their graveyards. You can see Portuguese fishermen or Welsh coal miners or French vintners buried alongside the old Spanish and Mexican land grant families. I find it all really fascinating. Our historic cemeteries are very fragile, threatened by earthquakes and wildfires. I want to record them before they vanish. Terrie Leigh Relf: What challenges have you faced as a writer and/or with a particular project? How did you meet them? What did you learn from these challenges and how did they make you a better writer? I guess the main challenge I have when writing nonfiction is to set reasonable boundaries on it. Originally, 199 Cemeteries was called 99 Cemeteries, but that meant leaving way too much out. Even 199 left out some really important places – and I feel awful every time someone discovers that I didn’t include their favorite cemetery. From the average reader’s perspective, though, a shorter book is more manageable than a doorstop. There’s no possible way to be completely comprehensive, even with something smaller in scope like the Bay Area Cemeteries project. Sonoma County alone has 75 historic cemeteries. I can’t possibly include them all, if I want to write about them in any depth. Terrie Leigh Relf: Are you plotter and planner or a discovery writer? Loren Rhoads: I like the sound of discovery writer a lot better than pantser! I definitely write to discover where the story goes. That’s true of my nonfiction, too. I write to learn. Terrie Leigh Relf: Are you currently a writing mentor? If so, what are your thoughts on mentoring? Loren Rhoads: I’m not mentoring at the moment, but I’ve served as a mentor for the Horror Writers Association. I wish I’d had a mentor to answer my questions and provide guidance when I was coming up. I hope I’ve inspired those I’ve mentored. They’ve taught me a lot about process and technique. Loren Rhoads: With my nonfiction, I am usually working under deadline, so I rely on my editors to critique or polish. I’ve worked with several groups in terms of my fiction. One of my favorite things about being part of a group is the deadline aspect. When I have to finish something in time for them to read it before a meeting, I find that really motivating. At the moment, I belong to a very small group of women writers that meet every month via Skype. Four of the five of us have worked as editors, so the critique comes at a really high level. Still, the best aspect of the group is the professional support. I’m awed by them. Loren Rhoads: I’m really shy, but while I was on the book tour for 199 Cemeteries, I decided to say, “yes,” to every promotional experience I was offered. You never know when one is going to pay off. For instance, last April, I went to StokerCon on the Queen Mary. Mysterious Galaxy Bookstore handled selling books at the convention. One of my friends invited me to join her for lunch with Mary Elizabeth, who programs Mysterious Galaxy’s events. Mary Elizabeth asked about my cemetery book and invited me to come down when it was out. Once that reading appeared on the Mysterious Galaxy calendar, a reporter from the San Diego Union Tribune called to interview me. He wrote a really lovely piece, which not only brought in a lot of people to the event at Mysterious Galaxy, it inspired a journalist from the Los Angeles Times to come to my reading at Stories Books & Cafe in LA. She interviewed me and a number of the audience members and wrote a great story. When that appeared, not only was my publisher happy, but Dark Delicacies, a bookstore I visited later in the week, was thrilled. Everything came from going to that first convention and saying, “yes,” to lunch. Terrie Leigh Relf: What are your thoughts on having an agent? Loren Rhoads: I had an agent for my first book, Morbid Curiosity Cures the Blues: True Stories of the Unsavory, Unwise, Unorthodox, and Unusual, published by Scribner in 2009. My agent had been able to generate excitement about the book, which sold at auction for a five-figure advance. Unfortunately, at Scribner, I had four publicists in the six months before the book came out. In the end, Morbid Curiosity Cures the Blues didn’t get any publicity that I didn’t set up myself. When the book came out, the banks were collapsing and Borders Bookstore failed. I did everything I could, but the book didn’t earn out its advance. When we’d agreed to work together, the agent said she was ready to support my career, both in fiction and nonfiction. Over the next several years, I sent her proposals for The Dangerous Type, Lost Angels, The Death of Memory, Wish You Were Here: Adventures in Cemetery Travel, This Morbid Life, and The Pioneer Cemeteries of the San Francisco Bay Area: three novels, two books of essays, and a straight nonfiction book. She rejected all of them except Wish You Were Here, which she wasn’t able to sell. Eventually, I gave up. I spent a year mourning the breakup – which was never official, because we never had a contract – then I sold two of the novels, one of which led to the space opera trilogy published by Night Shade, and two of the books of essays. The advances for the books I sold were much, much smaller than an agent might have gotten me, but it was more important to me to see my books published than have them languish on my computer. I wish I’d turned down the big advance in 2008 when we sold Morbid Curiosity Cures the Blues. Having an agent got my foot in the door at a big New York publisher — and nearly ended my career. Terrie Leigh Relf: What are your thoughts on self-publishing? Loren Rhoads: I’m still figuring out self-publishing. I’m collecting some of my previously published short stories and publishing them as chapbooks for the kindle. The publishing part is easy. It’s the promotional part I’m still sorting out. How do I get the word out to interested readers without spamming people who aren’t interested? Terrie Leigh Relf: Is there anything else you’d like to add that I haven’t asked? For example, what would you like to see more of in your specific genre? In the publishing field? Where do you see yourself in the next year? Next five years? etc. Loren Rhoads: I’m terrible about predicting where I could be in five years. Last year’s cemetery book came as a total surprise to me. It was the first time a publisher contacted me to ask if I had an idea for a book. Luckily, the team at Black Dog & Leventhal were great to work with and the book is doing really well. 199 Cemeteries to See Before You Die opened the door for more of my nonfiction. My next trick will be to find a publisher for The Pioneer Cemeteries of the San Francisco Bay Area. Then, a friend asked last month if I would consider co-writing a book with her on a topic that fascinates me . . . I have another succubus novel done in draft that I would really like to see published soon. It’s the sequel to Lost Angels, called Angelus Rose, about the succubus and her angel and Armageddon in LA. I also have several partial novels about a young witch who hunts monsters. It would mean the world to me to see them published. Alondra is the main character of the stories in Alondra’s Experiments. Stories about her adventures will appear in Occult Detectives Quarterly and Weirdbook this year. I’d like to finish a novella about her, too. I don’t know where I’ll be in another year, let along five years down the road. I’m just really excited to see where writing will take me next. Terrie Leigh Relf: Thank you again, Loren, for participating in my interview series again. Here’s to success with all your projects! Loren Rhoads is the author of 199 Cemeteries to See Before You Die and Wish You Were Here: Adventures in Cemetery Travel. She’s the author of The Dangerous Type, Kill By Numbers, and No More Heroes, a space opera trilogy. 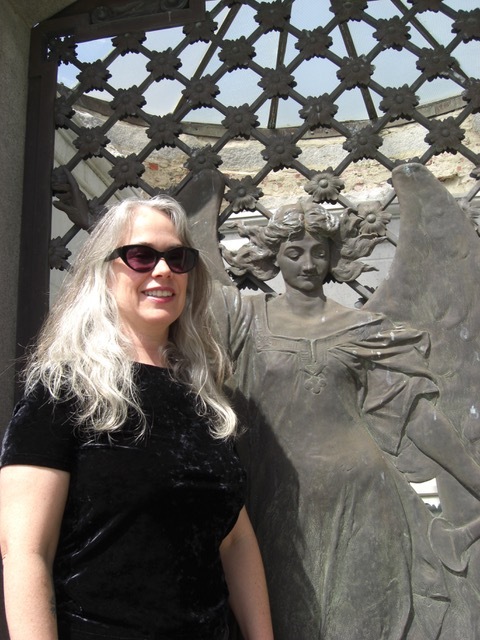 She’s co-author (with Brian Thomas) of Lost Angels and editor of Death’s Garden: Relationships with Cemeteries, The Haunted Mansion Project: Year Two, and Morbid Curiosity Cures the Blues: True Stories of the Unsavory, Unwise, Unorthodox, and Unusual. Check her out at lorenrhoads.com.